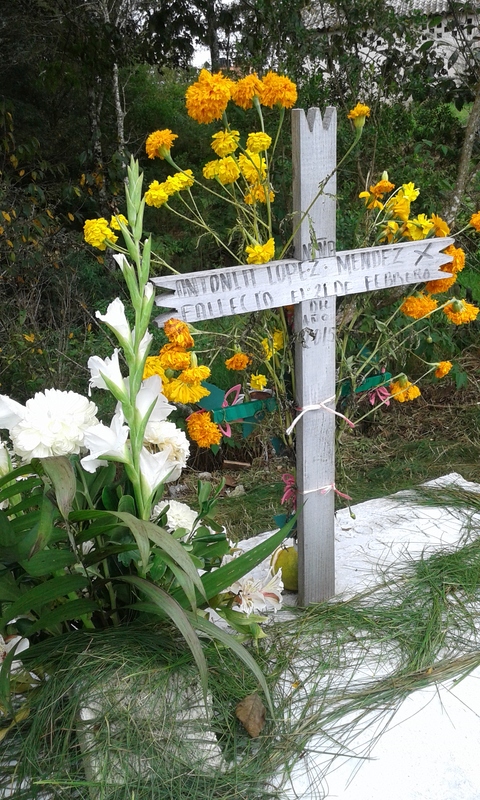 From October 26 and for a week approximately, families forced to leave their homes in Banavil, municipality of Tenejapa since December 4, 2011, announced that they would provisionally return to their lands “to put our flowers to our relatives who have gone ahead on the way , to remember and bring to mind the girl Antonia López Méndez and her two little sisters who are buried in the lands of her grandfather Alonso López Luna, who is still disappeared”. They again blamed the Mexican State for not resolving their displacement situation and for not having found Alonso López Luna. “It only seeks to tire us without giving us an answer,” they complained. On 4 December, 4 years since the forcible displacement from their community, the families from Banavil, Tenejapa municipality, once again raised their voices to demand that the Chiapas state government compensate their losses, cancel the two arrest-orders against Antonio and Pedro López Girón, and carry out the ten arrest-orders against those responsible for the forcible disappearance of Alonso López Luna and of the forcible displacement they experience. In a press-conference which involved the participation of the displaced, the Fray Bartolomé de Las Casas Center for Human Rights (CDHFBC) indicated that “the Mexican State is responsible for the forcible disappearance of Alonso due to its omissions and complicity with the perpetrators. According to testimony from the family, they had presented denunciations before the appropriate authorities due to death-threats, harassment, plundering, physical attacks, and denial of the right to education, without an adequate response from the governmental institutions, thus allowing the perpetrators to feel they were protected, in turn leading to further human-rights violations.” The CDHFBC indicated as well that there has been no “search and corresponding investigations that conform with the basic standards of judicial investigation, such that impunity and complicity with the attackers dominates […].” The CDHFBC added that the only person who had been arrested in the case, Alonso Guzmán López, was released in October 2013. From 30 October to 3 November, the four families displaced from Banavil, Tenejapa municipality, returned provisionally to their homes. During these days, they visited the gravesite of Antonia López Méndez, the daughter of one of the families, who died on 21 February 2015, 11 years of age. It bears recalling that the families were displaced at the beginning of December 2011, following an attack carried out by militants from the Institutional Revolutionary Party (PRI) carrying firearms. During the events, Alonso López Luna was forcibly disappeared and, to date, his whereabouts remain unknown. In this way, the attack also cuased the death of Pedro Méndez López, while six others were injured. Beyond this, Lorenzo López Girón, the son of the disappeared, was arrested, as was Francisco Santiz López, a Zapatista support-base (BAEZLN). Both of these have since been released. In a communique, the displaced families affirmed that “we returned well during our provisional return, though the bad governments (federal, state, and municipal) did not guarantee our security.” The displaced continue to hold the three levels of government responsable for the aggression that provoked the displacement, and they have demanded the revelation of the fate of Alonso López Luna, the carrying-out of ten arrest-orders against those responsible for the displacement and forcible disappearance, the return of families, the cancellation of two arrest-orders, the compensation of losses incurred, and the presentation with life of the 43 students from Ayotzinapa. [FOTOS][VIDEO]Retorno provisional de familias desplazadas de Banavil, Chiapas. On August 3rd, the forcibly displaced families from the community of Banavil, muncipality of Tenejapa returned temporarily to work their lands for a period of 15 days “without a guarantee of minimum safety conditions from the Mexican State”, affirmed the Center for Human Rights Fray Bartolomé de Las Casas. Before this temporary return, representatives of the displaced families they made it clear in a press conference that they are retuning “not because their denouncements are resolved, or because the authorities have offered full guarantee that the agressions will not be repeated”, but because they want to work their land to be able to sustain their families. “Our temporary return is to check up on our houses, clean the adjoining properties of our parcels and it is a temporary return without justice”, they mentioned. 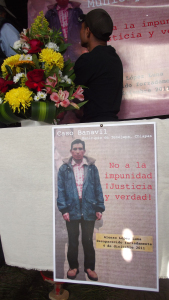 From their part, the Human Rights Center Fray Bartolomé de Las Casas denounced that “Since months ago the authorities told us they could return”, but it was not until the last meeting held with officials, hours before going to Banavil, when they were warned that there were no safety conditions. “Those were the exact words of Edgar Alonso, legal adviser of the authorities in Banavil, who were responsible for the attacks.” He told the government to say that there is no security, remarked the CDHFBC. 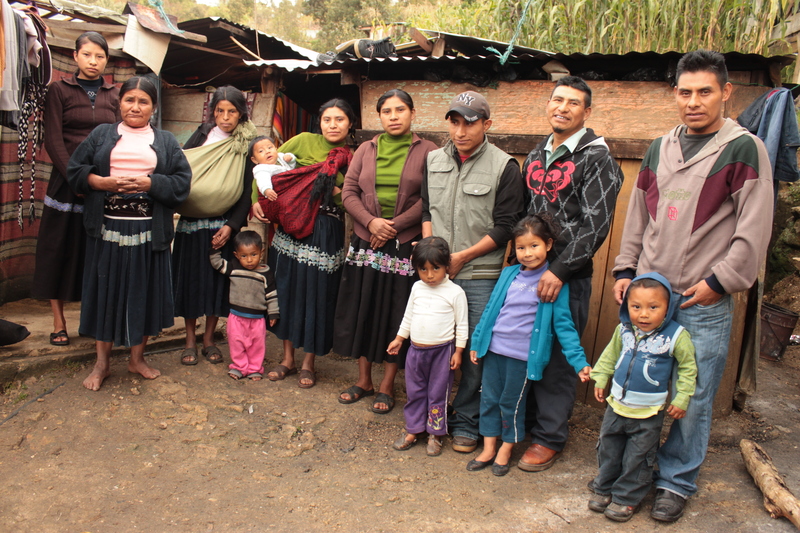 On 4 July, the Tseltal families from Banavil, Tenejapa municipality, completed 3 years and 7 months “since the armed aggression that took place on 4 December 2011,” which left several families displaced, and Alonso Lopéz Luna disappeared. 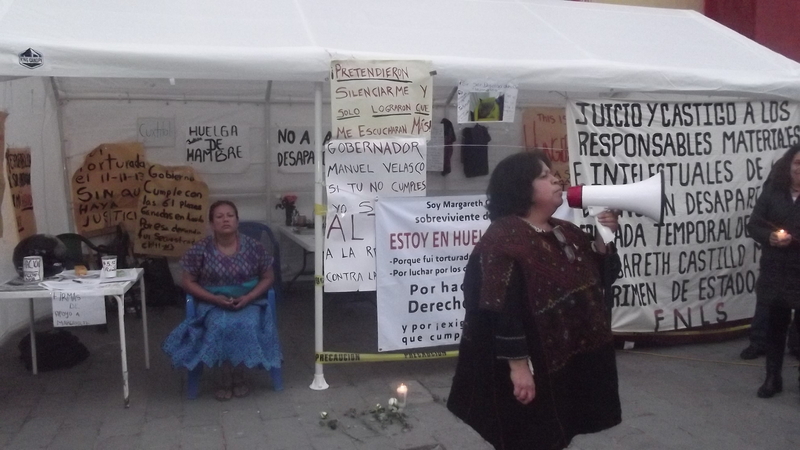 Since 8 March, in observation of International Women’s Day, Luisa Margareth Castillo Mora began a hunger-strike in San Cristóbal de Las Casas to demand that the state authorities attend to her calls for justice. She requests that the state government observe the complaint made against it in 2013 which condemns the Secretary of Education for not providing 61 persons (including her) nomination as base-workers, retroactive from February 2010. 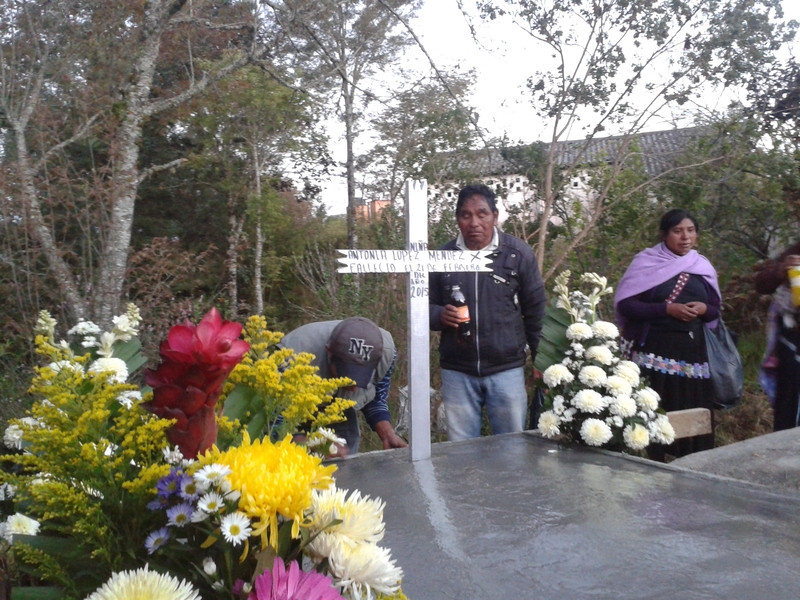 In November 2013, as an Urgent Action details, being published by the Popular Campaign against Violence against Women and Femicide in Chiapas, Margareth was “taken,” tortured, and subsequently left on the highway between San Cristóbal and Tenejapa. Nearly two years on, the events continue in impunity, and the motion handed down in her favor has not been observed. For this reason, the members of the Campaign have made a call for an investigation that be carried out soon, impartially, exhaustively, and efficiently into the attacks on her, for the observance of the dictated decision in terms of labor, for the compensation of damages and the cancellation of the arrest-orders against Margareth and other people involved in the protest-actions that have been mentioned.